Reliability Prediction tools such as ITEM ToolKit are absolutely essential when the reliability of your electronic and mechanical components, systems and projects is critical for mission success. When you develop products and systems for commercial, military, or any other application, you need to ensure reliability and consistent performance. Electronics and Mechanical products, systems, and components are naturally prone to eventual breakdown owing to the number of environmental variables, heat, stress and moving parts. The main question is "When?". Reliability is a measure of the frequency of failures over time. System reliability has a major impact on maintenance and repair costs as well as the continuity of service and customer satisfaction. During the reliability analysis or process, reliability prediction or MTBF (Mean Time Between Failures) has many functions and is often the foundation for any analysis. Whether you're designing new or updating an existing system, ITEM ToolKit can assist in determining the impact of proposed design changes. It also provides a deeper understanding of acceptable reliability levels under environmental extremes. You can evaluate acceptable limits of failure for your system, or meet overall design goals and the requirements of your clients as well. ITEM ToolKit offers the greatest flexibility and ease of use in 5 reliability prediction modules. The modules MIL-217, Telcordia (Bellcore), NSWC, IEC 62380 (RDF) and China 299B all share a powerful set of features and capabilities for inputting and utilizing data in multiple operations. Now you can generate the most complete analysis for your purposes. Perfect for both military and commercial applications. The ITEM ToolKit reliability prediction modules can aid in locating areas for potential reliability improvement. The software offers the most advance and diverse Multi-Document Interface (MDI) features allowing you to construct and analyze your system with accuracy and speed. Each reliability prediction module is designed to analyze and calculate component, sub system and system failure rates in accordance with the appropriate standard. After the analysis is complete, ITEM ToolKit's integrated environment comes into its own with powerful conversion facilities to transfer data to other reliability software modules of the program. For example, transfer your MIL-217 project data to FMECA or your Bellcore project to RBD. These powerful facilities transfer as much of the available information as possible, saving you valuable time and effort. "What-if" studies allow you to preview and evaluate the feasibility and quality of your design and the selection of your components. This allows you model the system, change components, and see the effects without having to construct an actual system. The IEC 62380 module supports reliability prediction methods based on the latest European Reliability Prediction Standard. Originally, a French Standard published by the Union Technique de L'Electricite (UTE, July 2000 - RDF). The standard has evolved and become the European Standard for Reliability Prediction (IEC 62380). Its unique approach and methodology has gained worldwide recognition. IEC 62380 is a significant step forward in reliability prediction when compared to older reliability standards. The Telcordia Software Module of ITEM ToolKit calculates the reliability prediction of electronic equipment based on the Telcordia (Bellcore) TR-332 and SR-332 standards. These standards use a series of models for various categories of electronic, electrical and electro-mechanical components to predict steady-state failure rates which environmental conditions, quality levels, electrical stress conditions and various other parameters affect. 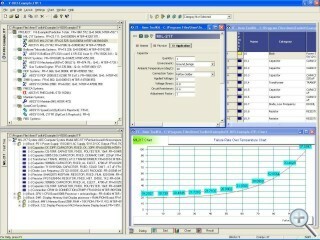 It provides predictions at the component level, system level or project level for COTS (Commercial Off-The-Shelf Parts). The NSWC module of ITEM ToolKit uses a series of models for various categories of mechanical components to predict failure rates based on temperature, stresses, flow rates and various other parameters. Standard procedures for predicting the reliability of mechanical components, sub-systems and systems are defined in the Naval Surface Warfare Center Handbook of Reliability Prediction Procedures for Mechanical Equipment (NSWC 06/LE1). The China 299B Module of ITEM ToolKit is a powerful reliability prediction program based on the internationally recognized method of calculating electronic equipment reliability provided in the Chinese Military Standard. This standard uses a series of models for various categories of electronic, electrical and electro-mechanical components to predict failure rates that are affected by environmental conditions, quality levels, stress conditions and various other parameters.